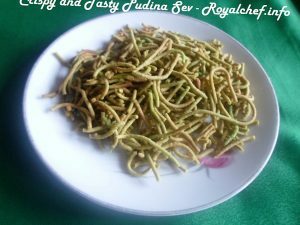 This is an simple to follow step-by-step recipe to prepare at home Spicy Mint or Pudina flavored Sev. This light green colored crispy and delicious Pudina Sev is not only a great snack to have in the house, but also a welcome add-on for your Diwali Faral. First separate the leaves of the Pudina from the stems and wash them. Add the Pudina leaves and Green Chilies along with ¼ cup of water in a mixer and make a fine paste. 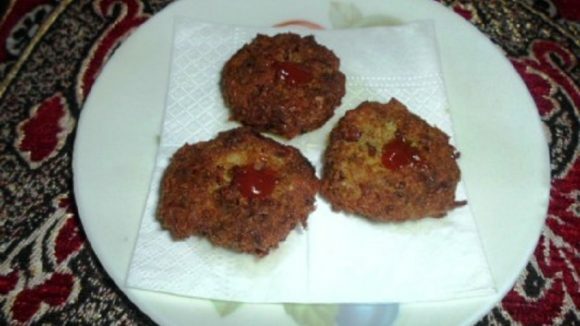 In a wide bottomed Thali, mix the Besan and Butter and then add the Salt, Asafoetida and Turmeric Powder and mix it and after that add the Pudina Paste and mix thoroughly after applying a little bit of Oil on your palms to prepare the Pudina Sev Dough. Then fill the Pudina Sev Dough in a Sev Maker[Sancha]. Then heat the Oil in a Kadai by setting the flame to high. Add the Sev directly to the Hot Oil using a small/fine Sev Mold. After adding the Sev reset the flame to low. Remove the Sev from the Kadai after it becomes crispy and keep it on paper so as to drain away the excess Oil. After the Pudina Sev cools down, store it in an airtight container.